We will inform you of any areas of concern & can suggest the most convenient & economical way to rectify them. We hear day in and day out how happy our customers are. We know you'll never find a more professional, knowledgeable, and experienced company. We are confident in the first 5 minutes you meet us you will know you hired the right company. With over 100,000 inspections completed in New York and on Long Island, come see why we are referred by your friends, lawyers and banks. We take great pride in every inspection we do and inspect each home as if it was for our own family. If you have a question about Home Inspections, Commercial Building Inspections, or Environmental Inspections please feel free to call me at anytime. AC&E Home Inspection & Engineering Corp. I have a bachelor’s degree in Aerospace Engineering and Prior USAF which may explain my attention to detail. I opened my own home inspection company in 1995. In 2005 NYS required a license for this profession with that I have been licensed since and personally have accomplished over 17,000+ inspections. I have grown to over 22 Engineers on staff covering 5 states. I love what I do, All of my licenses require ongoing education to keep current and I currently attend over 100 hours of continuous education each year. FINALLY... A Home Inspection Company that GUARANTEES its work... with a money back offer. We want you to be 100% Satisfied or we will send you a check for $500. After 15+ years in the Home Inspection Business I have seen many fly-by-night Home inspectors come and go. I feel sorry for the homebuyers that are victimized by these unscrupulous operators. I am so confident in our inspections that I'm willing to put my money where my mouth is. As far as I know, this is the only home inspection guarantee like this. This guarantee applies for a pre purchase single family home inspection only and no other service. A signed and witnessed release from liability form must be received to initiate the above process. This is mailed to you after we receive your request form and fully executed contract of sale on the home signed by both parties and postmarked within 3 days of the inspection. This offer stands for a period of 3 days after our initial inspection only. Of course, if a concern comes up after that period, we will be here for you; it's just that the 500.00 dollar offer will not apply. A written, mailed request form for $500.00 payment must be completed and postmarked within three (3) days of the inspection date and must have a copy of the fully executed contract of sale on the home signed by both party's. This offer is good for "pre-purchase" inspections only - ordered by a buyer for a single family home under full contract. The form below must be completely filled out and mailed along with the fully executed sale of contract signed by both parties for the sale of the home and post marked with in 3 days of the home inspection. All conditions must be met for the $500 guarantee to apply. Q: How long is the Guarantee good for? Q: How much do you buy the homes back for? Q: What if the home is very inexpensive or very expensive? A: No home is too inexpensive or expensive. Q: Privacy is important to me and my clients. Does InterNACHI release my client's information to anyone? Q: Is this an insurance product? A: No. We don't insure anyone's losses, we don't write checks to cover losses, we don't repair or replace any system or component, and we don't charge consumers for anything. We also don't reimburse the consumer for direct or indirect costs of buying the home, such as closing costs or moving costs. We merely offer to buy certain homes for no more than they were recently purchased for (in the past 90 days). Q: What if I miss something minor, such as a defective $10 GFCI? You aren't really going to buy back the home because I missed something minor--are you? A: Yes, we'll buy the home back. Q: What if one of my clients is suffering from buyer's remorse and so intentionally damages a $10 GFCI just to try to get you to buy their home back? You aren't really going to buy back the home--are you? Q: Will you buy back a home if it is discovered to have been a meth lab or if it has a horrible mold problem? Q: What if my client sues me because you won't buy his/her home back? A: InterNACHI indemnifies you. 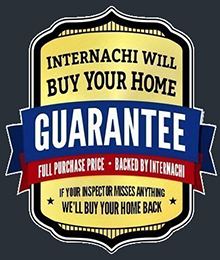 If any InterNACHI inspector participating in InterNACHI's "We'll Buy Your Home Back" Program is named as a defendant in a lawsuit on the basis that InterNACHI denied a claim under the program, InterNACHI will defend and indemnify the inspector on all claims against him/her arising out of its denial of the "We'll Buy Your Home Back" claim. Q: I want language to insert into my pre-inspection agreement that prevents my client from compelling me to buy his/her home. Do you have such a clause for me to use? CLIENT understands that under the "We'll Buy Your Home Back" Program, InterNACHI purchases the home – not the INSPECTOR. INSPECTOR's role is limited to his/her participation in the "We'll Buy Your Home Back" Program, but InterNACHI purchases the home. CLIENT understands that INSPECTOR has no obligation to purchase the home under the "We'll Buy Your Home Back" Program, and CLIENT’s sole remedy for any failure to purchase the home is against InterNACHI. Q: Is there a contract where I can read the terms and conditions of this program? A: No. We made it really simple and clean. The "fine print" consists of only four bullet points found in www.nachi.org/buy There's no legalese, and no "weasel" clauses.